It seems that everyone loves all things Disney, and at the center of it all is Mickey Mouse. 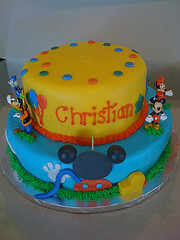 This cute cake includes Mickey along with figurines of his best pals, Donald Duck, Goofy and Minnie Mouse. And, with imagination being key, a cake that celebrates and includes Mickey Mouse can be many things and in take on many fun cake designs. 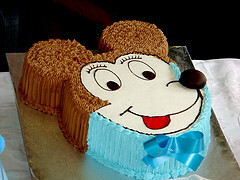 Another cute birthday cake idea for a Mickey Mouse party theme. This cake is easy to make with the help of a mouse cake pan. Read about our Minnie Mouse Party! Disclaimer: This site is in no way owned, approved, or operated by the Walt Disney Company, or any organization owned or operated by the Walt Disney Company and its business units. This website is not authorized by the Walt Disney Company. Neither I nor this website are affiliated with the Walt Disney Company in any manner. All opinions presented here are my own, unless otherwise noted. The images on this website are my own photographs which are my sole property and may not be duplicated, copied or altered without prior consent or are obtained thru creative commons. All photographs featuring the likenesses of Disney characters, figures, property, or logos are property of the Walt Disney Company and its associated business units.